Tiered Prices (aka volume/quantity discounts) is a great way to encourage customers to purchase more. The Volume & Tiered Discounts Kit app lets you set special prices on each order item purchased in bulk. 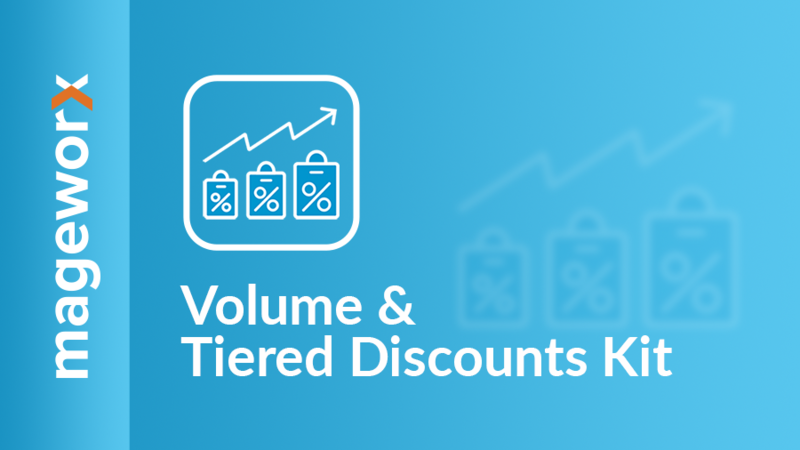 Setting up Volume & Tiered Discounts Kit encourages customers to purchase more. The app provides the comprehensive mechanism to tune these discounts: fixed, percentage, or the product price deduction. The Volume & Tiered Discounts Kit can be provided to all the products available or may be more refined based on the conditional logic. The geo-targeting allows picking the appropriate countries to display your promoted products for. 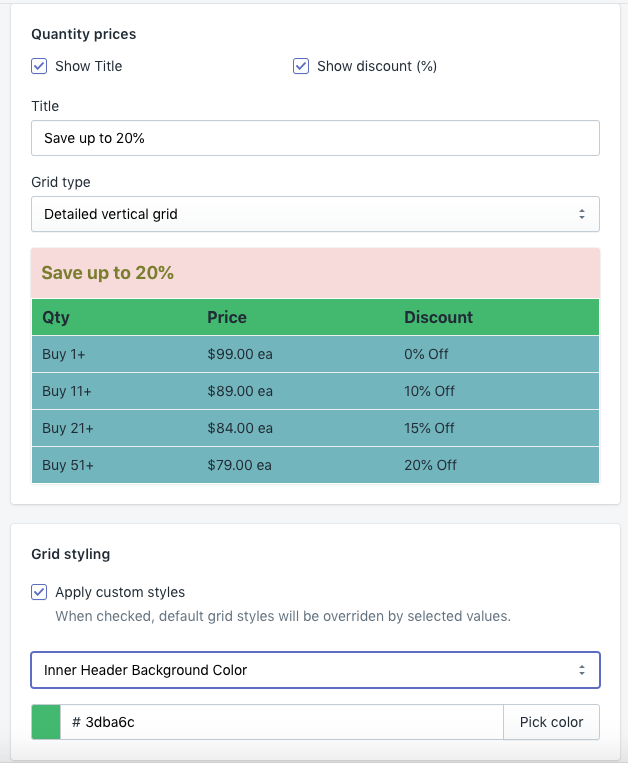 The app has the styling configuration: you can design the Volume & Tiered Discounts Kit grid so that it will fit your website look'n'feel. This screenshot shows the demo of the Volume & Tiered Discounts Kit on our store. As you may see, the values in the grid will be changed automatically depending on the initial product price. In most cases the app adds its code to the published theme automatically. If you have a customized theme you can either follow the installation instructions below and install it yourself, or you could contact us. Our professionals would be happy to install the app for you FREE of charge. Open the Snippets folder, and click the Add a new snippet option. The snippet name should be mw_TP_objects. Open the Layout folder, and click the theme.liquid file. To create, view, edit or delete the offers, please, go to Apps > Volume & Tiered Discounts Kit. You can easily filter all the offers to find the one that you need if the list is very long. It is possible to deactivate and delete the tier price rule directly from this grid. To create a new tier price rule, click the Create Offer button. When the offer is added, it is set as disabled (hidden) by default. To show it on the frontend, click the Activate button. The Internal Name is the title of the offer. This name will be visible on the backend and will help to detect the correct one on the tier price grid. 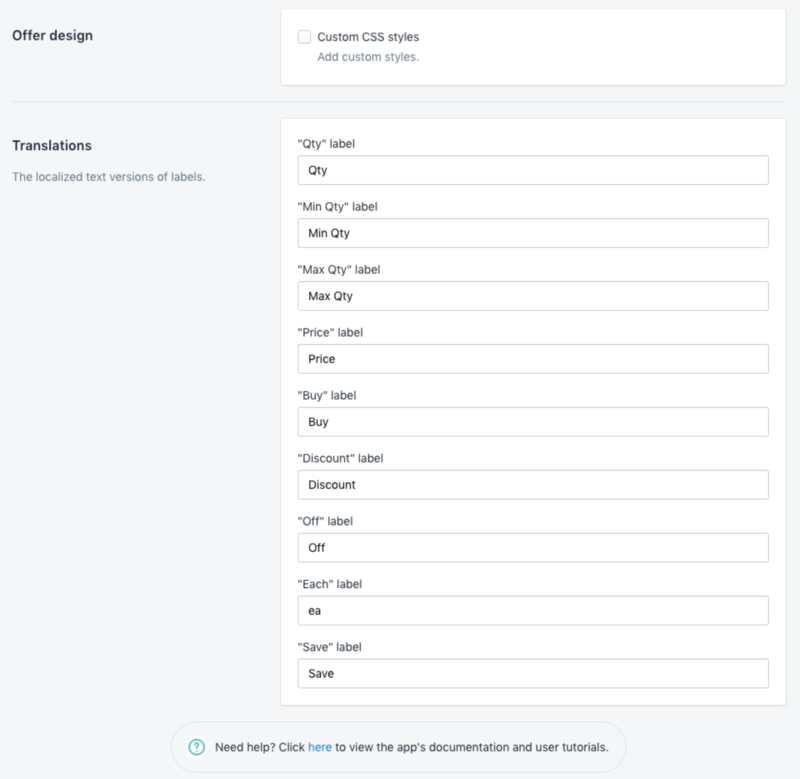 The Targeted Products has the radio button selection and allows adding this offer to all products, by condition or manually selected. 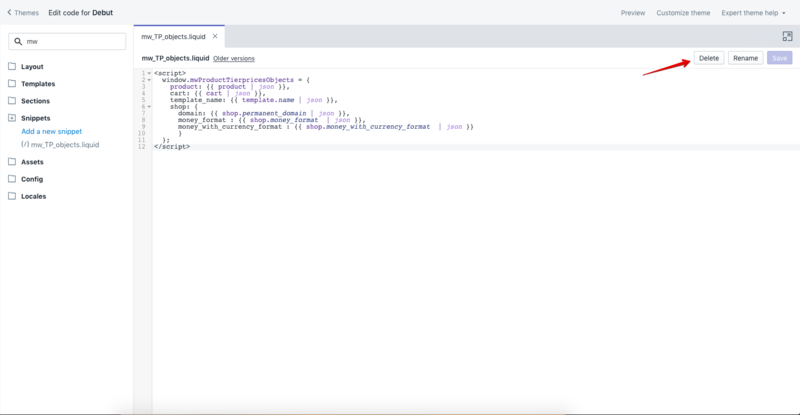 The condition section shown on the picture above has the ALL logic (so that if several conditions are selected, all of them should be met) or ANY (the product that meets any condition provided will meet the requirements). The Tier Pricing tab makes possible to add as many tiers as required according to the quantity of purchased products. 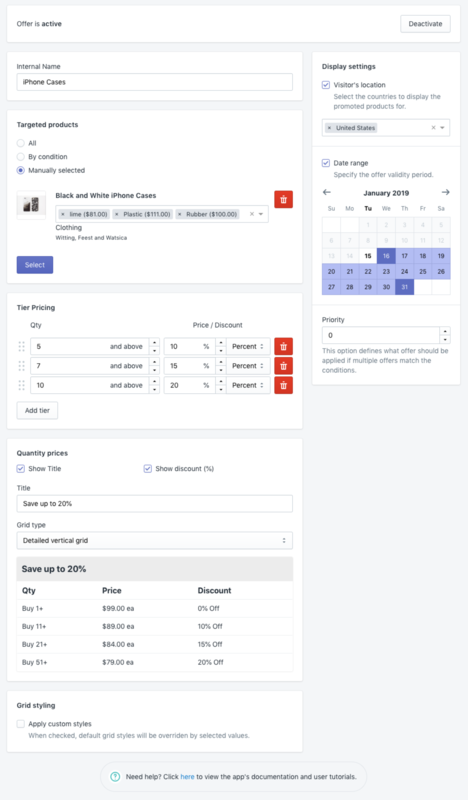 The row shows the minimum quantity of the products added in Volume & Tiered Discounts Kit for the rule to be executed and the discount to be added. The new price can be either written down manually (Fixed), the discount can be provided by Percent from the original value or as the deduction value (for instance, minus X dollars). Let's say that te original product price is $100. 1) The price for the 5-7 products (first row) is $95 fixed. 3) The price of the third row (10 products and more) is calculated as the simple subtraction from the value that you've added here: $100 - $30 = $70. The grid in the preview box is shown on the frontend. 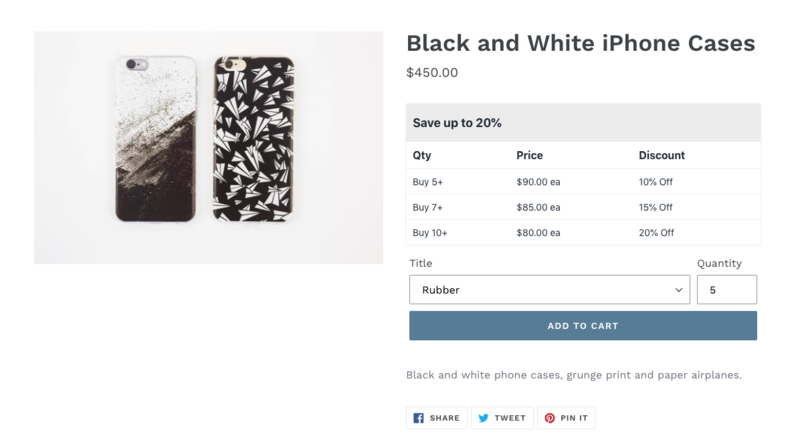 From here, you can rename the title of the tier price offer, show or hide the max quantity and the discount percent. Please note that the technical names of the columns can be renamed in the extension's configuration. This can be important for the stores where the English language is not used. The Visitor's location is the list of the countries where these Volume & Tiered Discounts Kit should be shown. To set the validity period of this tier price, click the first and the last date for the tier price offer to be active. Please note that if the event starts in one month and ends in another, you shouldn't click the last day of the month when the event has started. Use the arrow keys instead and select the date to finish in another month. The Priority configuration defines which offer should be applied if several tier price offers match one product. The basic app configuration provides the big number of the settings that can be changed according to your business needs. Go to Apps > Volume & Tiered Discounts Kit and click the Configuration button. The app allows inserting literally any CSS style customizations. For this, please, populate the Custom CSS styles according to your vision. The Translations section allows changing the default columns names. When the customer purchases the products using the Volume & Tiered Discounts Kit, the price of the products becomes different. 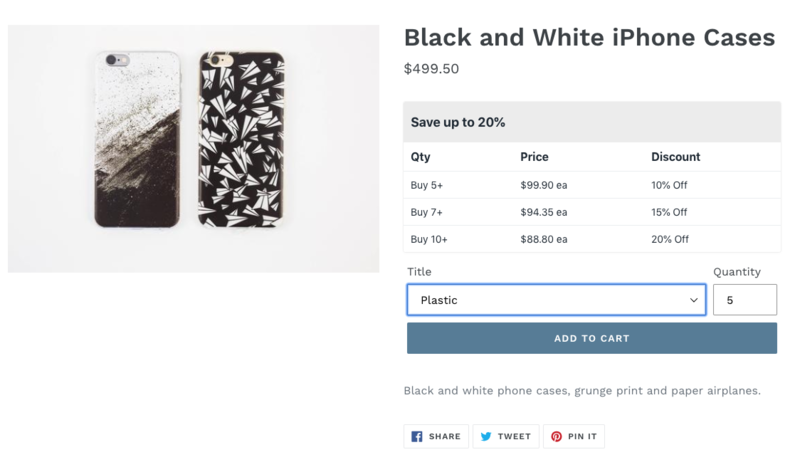 Shopify doesn't allow any changes of the initial products in the order so purchasing a product with the tier price, creates a discount which applies automatically at checkout. 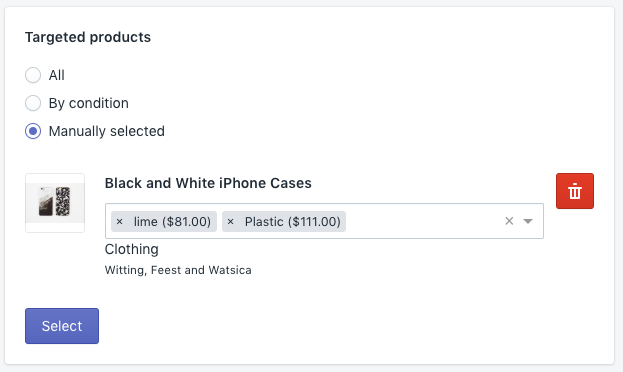 From your Shopify admin, go to Online Store > Themes, find the theme you want to remove Advanced Bundle Products App from and click Actions > Edit code. Open the Snippets folder, locate the snippet named mw_TP_objects.liquid and click Delete button. Remove it and click Save button. For any technical and pre-sale questions, feel free to contact us at apps@mageworx.com.